. Every effort has been made to display the colours of our scarves as accurately as possible within our product shots. However, as computer monitors, tablets and mobile devices vary, we cannot guarantee that your monitor’s display of a colour will be completely accurate. If you have any queries please do email or call (see contact page for details). Design: As with the colours, every effort has been made to show a true representation of all designs, however if you are having difficulties seeing the pattern/design please do let us now and we will be happy to either send you images or amend website errors. All designs are copyright & intellectual, creative property of Bibi Herron and have been developed by both hand and digital manipulation. Any reproduction of Bibi Herron’s designs will result in legal action. Company Address: We are currently in the process of relocating and an exact address will be provided as soon as possible. *Your use of the Site and its contents grants no rights to you in relation to any copyright, designs, trademarks and all other intellectual property and material rights relating to the Content. All content including trademarks, designs, and related intellectual property protected by national intellectual property rights. You are permitted to use the Content only as expressly authorised by BIBI HERRON. Any reproduction or redistribution of the above listed Content is prohibited and may result in legal action. All BIBI HERRON scarves are designed by Bibi Herron here in the UK and sent to Lake Como in Italy where there are digitally printed on the finest silk and finished with hand rolled edges. Due to the nature of the hand rolling, the space between each stitch will not be exactly the same as the last – this is inherent to the hand finished, luxury nature of the product. We hope that you love your new Bibi Herron scarf. 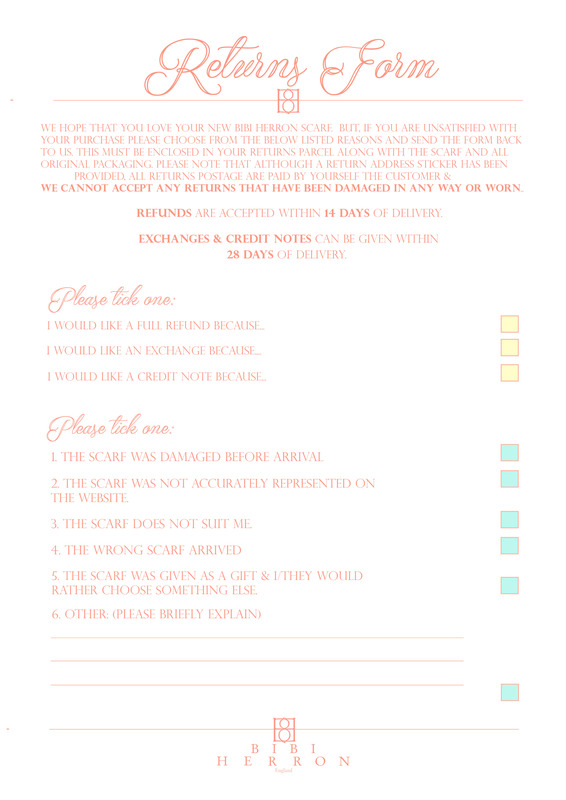 But, if you are unsatisfied with your purchase please fill in a copy of the below form which will be sent to you with your scarf and send the filled in form back to us. This must be enclosed in your returns parcel along with the scarf and all original undamaged packaging. Please note that although a return address sticker has been provided, all returns postage are paid by yourself the customer even if your initial purchase included free delivery. We cannot accept any returns that have been damaged in any way or worn. Faulty Scarves. Scarves are classified as faulty if they are received damaged. Please note that items that have been damaged as a result of wear and tear are not considered to be faulty. Late Returns. For returned scarves to be accepted your item should be returned to us within 14 days of receiving your order for a full refund and 28 days of receiving your order for exchanges or credit notes. Returns outside of this period will be dealt with by customer services and continued only at the discretion of BIBI HERRON. Repeated Returns. We offer a flexible returns policy to make your online shopping experience enjoyable and easy. However, we do monitor the number of returns made and may refuse to accept orders/ returns at our discretion if goods are returned repeatedly. Each scarf will be sent complete with luxury packaging, care package and a returns form (please see below) which must be sent back filled in along with the scarf in case of return.